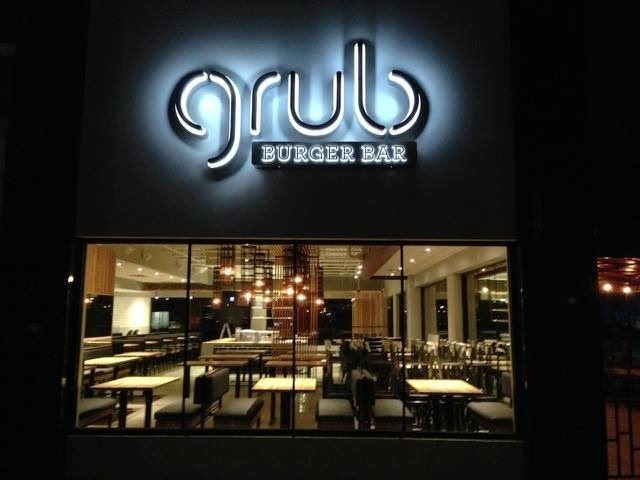 College Station, Texas-based Grub Burger Bar opened its second Atlanta location yesterday. The new Grub opened at Brighten Park, fka Loehmann's Plaza, near the corner of Briarcliff and North Druid Hills Roads. Grub Burger Bar opened in place of longstanding tenant Lettuce Souprise You, which closed this past July. The first Atlanta area Grub opened at Akers Mill last April. A number of additional locations are reportedly in the works in the greater Atlanta area. In other Brighten Park news, Plato's Closet has now moved to its third home in the center in just the past few years. Once located to the left of the Loehmann's space (upcoming The Fresh Market), the store moved to the right, next to the UPS Store, not long ago. Now Plato's is in a nearly identically sized (square footage wise) space all way on the far end of the center, between Clothing Care and The Pet Set. Laurend Abraham has rebranded his south Buckhead eatery, Euro Hookah Lounge. Previously known as Tantra, and specializing in Mediterranean fare and hookah, the business became Vin Vie Bistro, a "French Steakhouse," this past May. Euro Hookah Lounge launched last month and features hookah and Mediterranean fare. The new name and theme seem to be an attempt to return the business to the Tantra days. Avis has relocated their Buckhead area rental office from Pharr Road to the Atlanta Marriott Buckhead Hotel & Conference Center on Lenox Road. American Eagle Outfitters has closed its location at Gwinnett Place Mall in Duluth. Kaleidoscope Bistro & Pub plans to expand their restaurant into the former Yoforia next door. The frozen yogurt shop closed a few weeks ago, and its space will reportedly become an extension of the Kaleidoscope bar. Fresh off its acquisition by Coach, Stuart Weitzman is renovating its store in the first level of Neiman Marcus at Lenox Square. The store was previously renovated around 2009 to give it the then current wavy white lines similar to the store at Perimeter Mall. The Lenox Square store is slated to reopen late next month. A new Krispy Kreme has opened on Pleasant Hill Road in Duluth. The new Krispy Kreme opened last week at the corner of Pleasant Hill and Old Norcross Roads in the Micro Center-anchored center. An existing Krispy Kreme, about three miles away, and also on Pleasant Hill Road, (next to a Chick-fil-A Dwarf House) closed in favor of the new store. Aldo's Cafe in Tucker has closed. The Mediterranean / Italian eatery was located in a small center on Hugh Howell Road, adjacent to Publix. The new Varasano's Pizzeria at Perimeter Mall is now scheduled to open "in the spring." The restaurant is located on the upper level of the Dunwoody mall and makes use of two spaces that were not previously equipped as restaurants. The Varasano's team has experienced more challenges than originally anticipated in combining and building out the space. Varasano's at Perimeter Mall was originally announced last summer with a planned opening last fall. 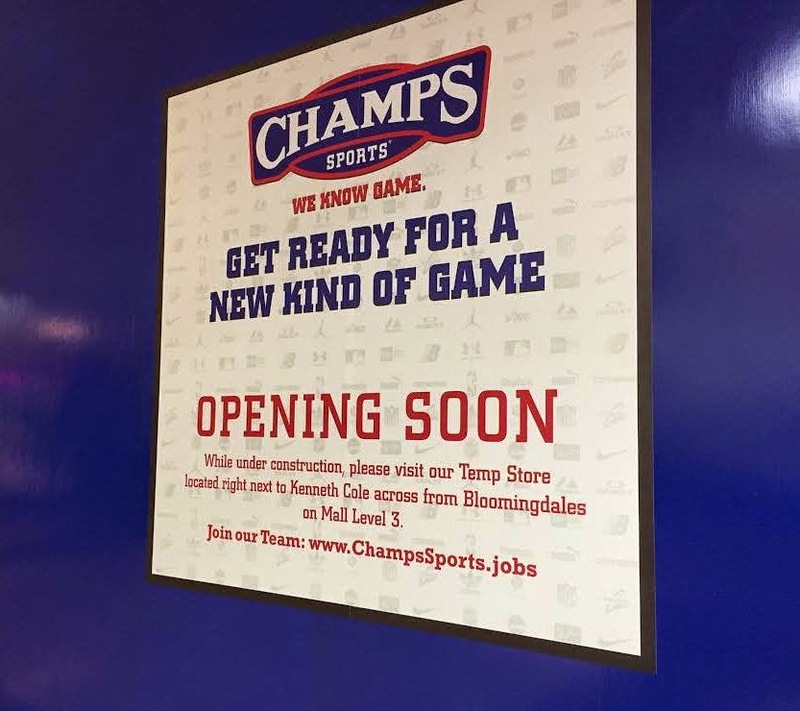 Champs Sports is in the midst of expanding and renovating their store at Lenox Square in Buckhead. The new store will occupy both the current space as well as the adjacent former Forever Diamonds space. The athletic apparel and footwear retailer has temporarily set up shop in the former C. Wonder space one floor above its existing store. Jack Spade will be closing its Atlanta boutique in Westside Provisions by the end of the month. The store opened in March 2013. Kate Spade & Co, the brand's parent company, announced last month it would close all Jack Spade stores as well as the lower priced Kate Spade Saturday stores. Kate Spade Saturday will be reintroduced within Kate Spade New York stores, while Jack Spade will continue to be available via its e-commerce platform, as well as its wholesale partners such as Bloomingdale's and Nordstrom. La Creperie has opened in the Fashion Cafe at Lenox Square. The crepe eatery offers a total of seventeen different crepe varieties inclusive of two breakfast crepes. Customers can also opt to "create their own crepe." Given the food court struggles of a previous vendor offering gourmet waffles, I'm curious how this shop will fare. TUMI is opening a new location on the upper level of Perimeter Mall in Dunwoody. Tumi has an existing store at Lenox Square as well as a licensed location (in partnership with Mori Luggage & Gifts) at Phipps Plaza. Macy's has agreed to purchase Washington, D.C.-based cosmetics retailer Bluemercury. Macy's paid a reported $210 million for the chain that today operates 60 locations throughout 18 states, in addition to a growing online operation. Bluemercury plans to open an additional 20-30 locations by the end of 2015. Bluemercury locations also offer spa services like facials, massages and waxing. The chain previously operated a location at Perimeter Mall in Dunwoody, but it closed around 2009. Last summer, Bluemercury re-entered the Atlanta market with a location in Buckhead adjacent to Whole Foods Market. A new Marco's Pizza is coming soon to Piedmont Peachtree Crossing in Buckhead. The Kroger Fresh Fare-anchored center is already home to Piu Bella, another pizza restaurant. Marco's Pizza in Buckhead will open adjacent to one of my favorite casual eateries, Chow Bing. Marco's has been aggressively expanding its Atlanta presence adding new locations both intown and OTP. Other new Marco's are coming to 800 North Highland Avenue in Virginia Highland and to 2555 Delk Road in Marietta. Staples at The Prado in Sandy Springs has closed. As always lots of great information. A couple of somewhat sad updates here with the closing of American Eagle at Gwinnett place and the Aldo’s in Tucker. I worked near Gwinnett Place a few years ago and remember when that area was really nice, so it’s sad to see how it’s deteriorated. Also, I remember my parents would take us to Aldo’s back when it was still an Italian place for birthdays and stuff. Of course I have to admit I haven’t been near Gwinnett Place or eaten at Aldo’s in years and apparently no one else has either. Staples is buying Office Depot, so they’ll be a lot more closures and consolidations. In regards to the former comment, the Staples in Snellville along the popular Scenic Highway also closed a few months back. I wonder what's going on with Staples. Also, I am really shocked about the closing of American Eagle at Gwinnett Place Mall. Because AE is such a staple store that is found in both higher and lower end malls, I thought it wouldn't be closing anytime soon. I guess Gwinnett Place really is in its final days. That leaves only the Staples across the Phipps anywhere in the Chamblee/Dunwoody/Sandy Springs area really (and that's almost to what I would call Buckhead, actually). What spots in Perimeter Mall did the Varasano's take over? The Staples on Peachtree across from Phipps Plaza closed a couple months ago. Signs on the door direct customers to their "nearby" location on Ponce de Leon Avenue in midtown. Varasano's took over the former Doctor's Vision Works as well as a small portion of the former Hudson Grille. Nice to see K-Pub expanding. Must be doing well. Great spot for cocktails. The Staples on Highway 9 in Milton just closed. I was there just a few weeks ago so it must be recent and a preliminary move with the upcoming merger. We also lost the Office Max on Northpoint Pkwy (soon to be an REI), so our office supply places are dwindling. But if you have Amazon Prime or are a Staples Business Rewards member, so you can get pretty much anything shipped to you for free. It's always nice to be able to see, feel, and touch the merchandise, and take it home with you IMMEDIATELY. It would be unfortunate if all physical storefronts disappeared, but that sure seems to be what the trend is. I guess Office Depot-Max will eventually be called Staples-Depot-Max. More and more office supply stores are closing and I now find myself driving out of my way to pick up a few things. I agree with the other person: sometimes you want to see the merchandise before you buy it. Sometimes I only need some labels and some highlighters, not enough to place a delivery order. And deliveries can be a pain in our office due to strange hours and key card access. The Office Depot on Peachtree Industrial is still open but the customer service there makes you wanna jump in front of a train. Costco is a good alternative for some things but you have to buy larger quantities. Adding to Anonymous 10:16 AM regarding stuff being out of the way, the Staples at the Prado has a banner that says "Visit us at 650 Ponce De Leon", no offense as I'm sure they mean well, but I'm driving all the way to Ponce to pick up some folders or labels. I guess that's the closest location, but I thought that was the dumbest thing I'd ever saw.